I work with musicians, so it is not surprising that some of the dreams I comment on have musical themes. A few weeks ago, I highlighted a dream about playing the French horn. This week, the dreamer is a violist. For those who may not know, a viola looks nearly identical to a violin. However, it is slightly larger and its musical range is lower; it has a “deeper” voice. Violas are often used in quartets with other instruments from the violin family. 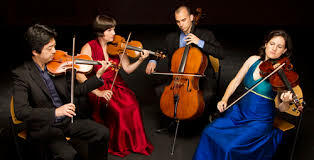 In the above photo showing a string quartet, the lady in blue is playing the viola. I had people over to play quartets, and I was playing violin this time. But my strings wouldn’t stay in tune because the pegs kept slipping. So I couldn’t play, and I was not only embarrassed but really, really angry. What does one initially do with dreams? For most dreamers, the tendency is to become emotionally invested in the dream’s story. The dreams themselves participate in this process. Dreams have to try and stay in the dreamer’s awareness as the dreamer negotiates the fragile states between being sound asleep and becoming fully awake. So dreams use striking, startling imagery to help make their presence felt. In this case, the dreamer was subject to strong emotions: embarrassment and intense anger. When she woke up in the morning after this dream, the anger was what stayed. That, in turn, focused her attention on the literal events of the dream story. That was a good thing at first; it helped her remember the dream events. Her first comment to me was notable—and quite common: “Maybe this means I should only play the viola.” That response is understandable and typical of many dreamers. But it comes from omitting the next, indispensable step in dream interpretation. One has to step back from the dream’s story, and remember that dreams speak in their own language. That language needs to be translated into common usage, and like all translation work, this takes some thoughtful effort. The first step in “translating” dream imagery into common language usage, is to pick out the important words of the dream. Those words are the symbols that carry the heart of the dream message. And those are the words that have to be understood as metaphors with a different kind of meaning. In this case, the dreamer had written her dream down which made the process simple. It was easy to go through the dream and pick out the important words and phrases. What follows is the list of those words and phrases: people, over, play quartets, playing violin, this time, strings, wouldn’t stay in tune, pegs, kept slipping, I couldn’t play, embarrassed, really really angry. On Wednesday, we’ll take a close look at those symbols as we translate them into metaphors.